B﻿erkeley Trilene Micro Ice line﻿﻿﻿﻿ comes in two distinctive colors; one is red and other is steel. The line has less stretch and is designed to set in strong hooks. This will enable to control the jig better.This line is designed specifically for fussy fish of clear water. It can be said as the strongest and thinnest monofilament fishing line. Its low stretchability will help to control the lure easily. The sensitivity will also be more for quick sets of a hook. If you prefer ice fishing using monofilament, then this Triline Micro Ice line might be the perfect one. The red one works well as from above the water the line can be seen through ice and snow. But if you prefer fishing spooky fish, then the steel line will be the one you need. 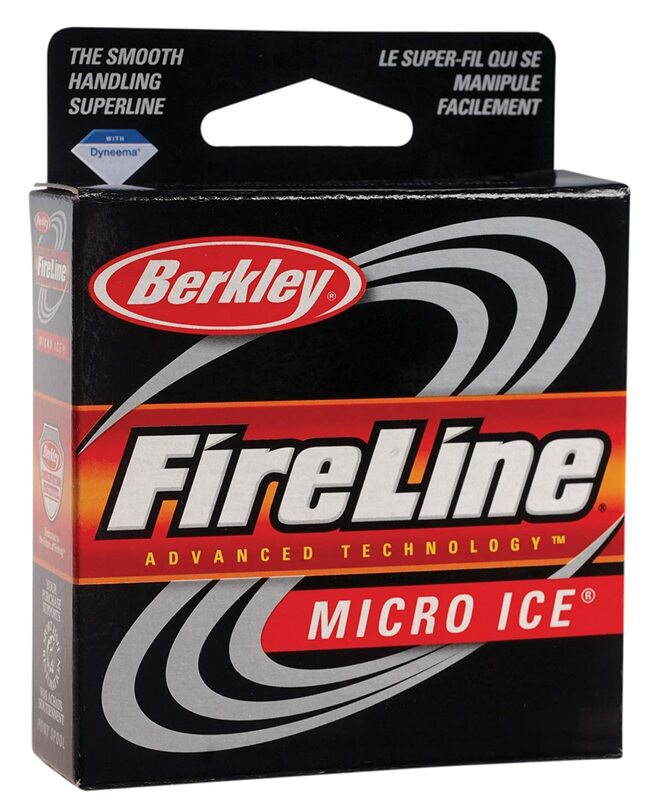 Berkley Fireline Micro Ic﻿e is a fishing line that is thin and strong. The line can be handled smoothly and is particularly designed for ice fishing. It is sufficiently lean to control even the smallest jigs. This ice line comes in two different colors; one is crystal, and the other is smoke. It can be limbered smoothly, and it will help you to control it easily in cold weather. Being thinnest, the line has the least visibility. Berkley triline ice fishing line is very strong. It is so strong that it can pick a big pike, lake trout, walleye or any large fish. The line also consists of less memory and it indicates that you wouldn’t have to think about fishing using slinky on the ice. The line is very thin and too strong for its diameter. 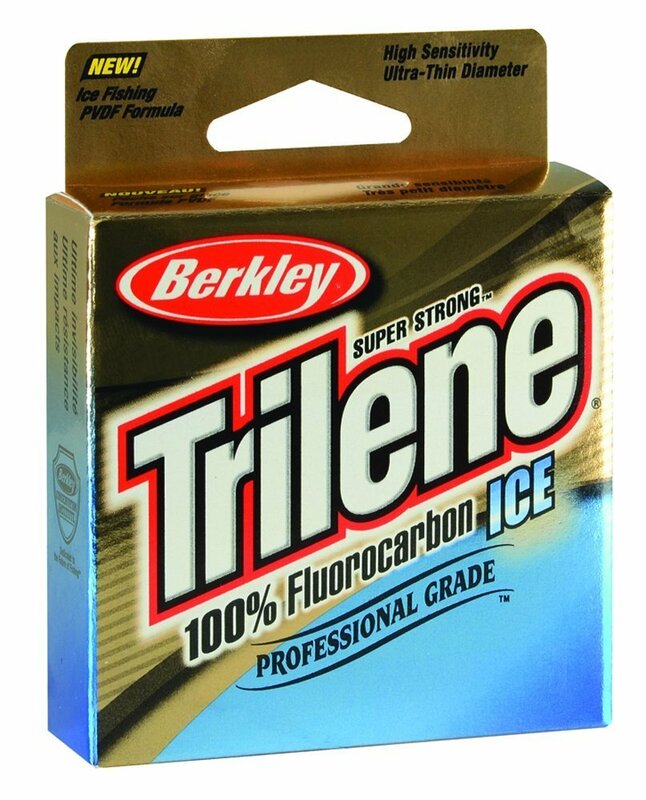 Berkley Trilene Fluorocarbon line is developed particularly for ice fishing. It is 100% formulated fluorocarbon fishing line. This fluorocarbon ice line has low stretch. The formula of low stretch has enhanced its sensitivity and allows setting strong hooks. The diameter of the line is extremely thin. And it helps to handle the lure better. This fluorocarbon ice line is almost invisible under-water. This provides a realistic look of the lure more. In each pack, you will get 75 yards. It comes in different sizes starting from 1lb, 3lb to 5lb and 6lb. The line can be managed superbly. It has low memory, and it allows handling it more easily. Moreover, it is resistant to abrasion. 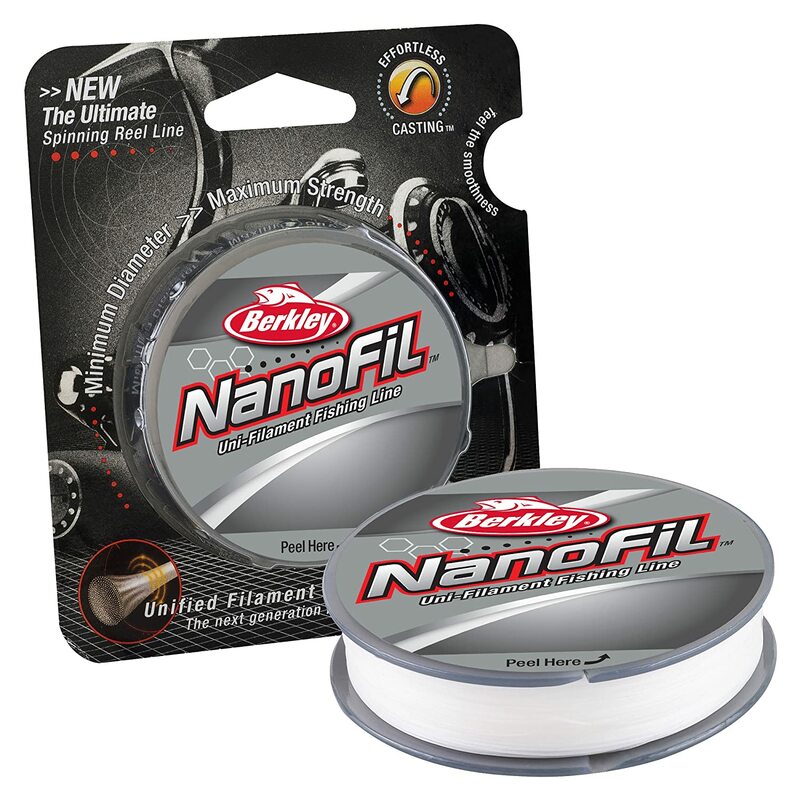 Berkley NanoFil is the first uni-filament line of fishing. Neither monofilament nor braid fishing line possesses this feature. It is the longest line of casting which has no stretch at all. Being completely void of a stretch, this uni-filament line is highly sensitive. It allows the fishermen to experience exclusive distance of casting as well as accuracy. This will ultimately make them cover water and catch fish more. It is the thinnest Berkley fishing line and is also highly sensitive. You will be able to feel the lightest pick-ups as well as the jarring strikes. The line comes in the least diameter but with superb strength. There is probably no memory in it, and this eventually would discard the tangles of line. As a result, you will be able to spend sufficient time in fishing rather than in untangling. It has a good castability. It is even possible to cast the lightest lure. 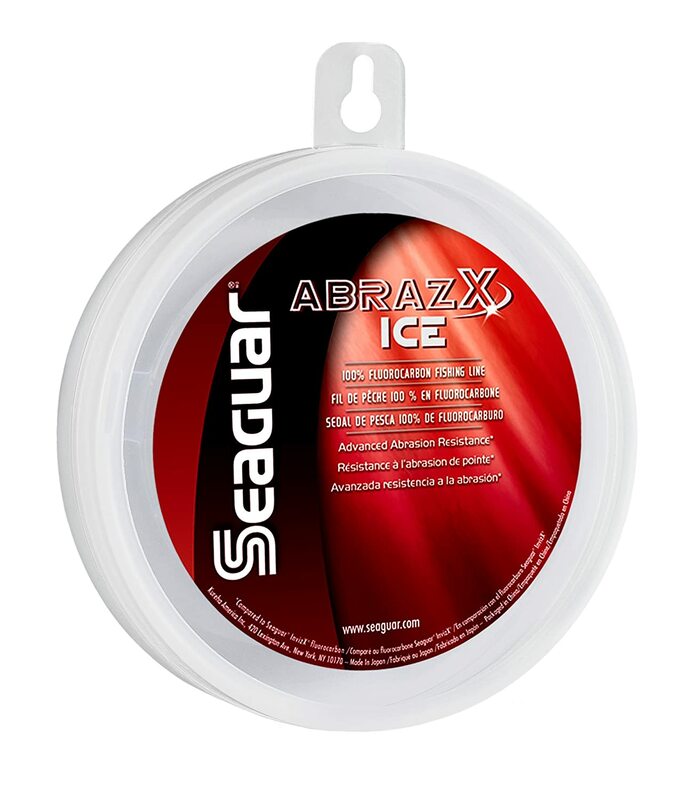 Seagaur Abrazx is a 100% fluorocarbon ice fishing line. The line provides incredible resistance to abrasion. It is too much soft and hence, it can be limbered easily. This ice fluorocarbon line provides great tensile strength. It is designed in such a way that it can combat weeds, docks as well as rocks. The line can handle any harsh weather conditions. Doesn’t work exceptionally to make it different from a similar product. Monofilament fishing line is inexpensive compared to the other types of line. If you go for fishing frequently, then this might be the right line for you. These lines can be obtained in different types of color. Monofilament lines can float on water. This will absorb light along with water and produce a small reaction during any movements. However, this probably reduces the life expectancy of the line. If you use the fluorocarbon line, then you could not see it under water. This line is heavier than the other types which make the lure to dive deep as well as fast in the water. It will not absorb water and in fact will render resistance from sunlight, gasoline and battery acids. If you fish using this fluorocarbon line, then you wouldn’t have to employ lures, light reels and rods to endure it. These lines, in fact, can also be slippery. Braided fishing line is possibly the oldest and powerful of all fishing lines. The twisted nylon strands are probably the thing that makes the line powerful. However, these are a bit expensive than the monofilament lines. The diameter of the line is thin and it provides good resistance to abrasion. This probably makes it suitable for deep water fishing. Moreover, strong rods of fishing would be required while employing the braided line of fishing. Ice fishing now might be the industry of billion dollars all over the world. Various modern types of equipment are coming in front to make the process easier. One such is the new braided line which is made especially for ice fishing. The lines will possibly possess the coatings of space-age. If you use this line, then you not have to think ever about replacing. It will neither break nor would require new line each year. Like the usual braids, these are also opaque and stretch less. Unlike the monofilament and fluorocarbon, the light will not pass through it. If you are selecting an ice fishing line, then you would have to think some of the facts before buying. The line used for fishing can coil more similar to that of a slinky. Now this might produce various types of problems. You might also have to spend more time in untwisting the line than fishing. The worst thing is that you might also miss the bites. If you want to ignore such circumstances, then you would have to choose a less or no memory ﻿﻿fishing line. Cold weather condition can act as struggling both on people as well as equipment. Your fishing line would also face the same impact. If you are fishing with a regular line in cold condition too, then the line might become fragile. Even the sharp ice edges can destroy the fishing line. Hence, if ice fishing easily is important for you, then you would have to use a line that is sufficiently firm to control all rough conditions. It is important during ice fishing to choose a line that provides resistance to abrasion. However, it is also important to look for its durability. A very delicate and durable fishing line combo will be just perfect for ice fishing. Ice fishing is different from that of open water fishing. In open water, the fish probably takes less or no time to see the bait. But in ice fishing, it sees the bait for much time. The fish will just ignore the lure if it seems suspicious to them. Hence, it is important that you choose a line for ice fishing that is less or not at all visible in ice water. There are few new lines of fishing that have water repellant hydrophobic coating. The coating would help to repulse the water and likewise it would prevent the line from freezing. It will protect the line from any rough conditions of weather. Little or no stretching will attract more fish to you. While purchasing an ice fishing line, you would have to choose the one that has less or no stretching. You will be able to place the hook easily and bag fish more. Whether you are fishing in open water or ice, you would have to search out the fish, put the lure to make them eat it. Most of the fishermen probably use rod and reel for ice fishing. However, you would require a line for the reel. If you are fishing in ice, you would have to consider certain things. The fish can see the lure longer in it than open water fishing. The lure sits perfectly ahead of the fish, and it examines the lure for longer in ice fishing. As a result, visibility of line is an important factor during ice fishing. Moreover, the lines that are designed for warmer weather act distinctively in colder weather. Therefore, you would have to choose a line that works well in the cold. The rocks, weeds and the sharp ice edges of the hole can cause destruction to a line. Therefore, the line you select for fishing in ice would have to be capable of combating all the challenges of ice fishing. Trilene Micro lines of ice and Trilene cold weather are formed specifically for ice fishing. Both of these lines can be easily handled in cold conditions. 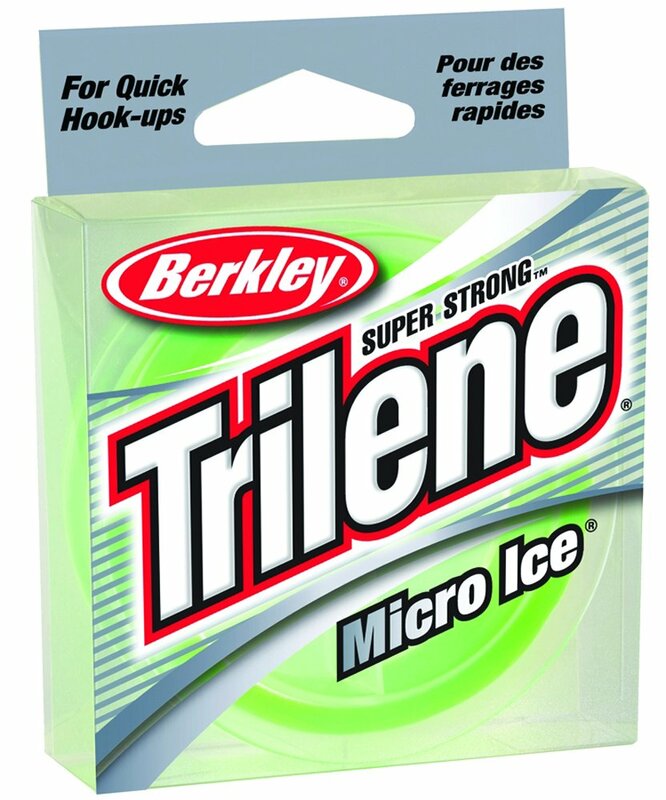 From the top five ice fishing line, Berkeley​ Trilene Micro Ice fishing line is the best one. The reason behind it is that it consists of all factors that we have considered or have been looking for in the best fishing ice line. This micro ice line is highly sensitive apart from being the strongest and thinnest. Its color makes it disappear easily in water and also possess sufficient strength to pick up any heavy sized fish. However, the runner-up is the Seagaur Abrazx Ice Fluorocarbon fishing line, followed by Berkley NanoFil Uni-Filament Line, Berkley Trilene Fluorocarbon 100% Ice Line and B﻿erkley Fireline M﻿icro Ice fishing line.